Good morning! And welcome to our annual tradition of complaining about the LEGO Star Wars Advent Calendar! I’ll be your host for this roller coaster ride full of disappointment and slight amusement. I am substituting for our regular host of the program, Ken Robichaud. He is unable to take on the task this year due to surgery. Something about a bunion removal on his pinky toe or something like that. So, without further ado, let’s get right to it! Day 1 is a Clone Wars-style micro AAT. Right out of the gate we’re treated to a micro vehicle and it does it’s job pretty good. I’m being honest when I say I haven’t looked ahead so I’m not entirely sure if the Clone Wars era AAT is a sign of things to come. Despite my trepidation of being inundated with Clone Wars builds, if they’re all as good as this, I don’t think I’d mind so much. And yet, with such a strong start, tomorrow can’t be anything more than a big pile of disappointment. Come back tomorrow to see if I’m right. Second day in and here we have a Super Battle Droid. Another Super Battle Droid. He might be the only minifigure thus far to have a repeat appearance in an Advent Calendar. He was last seen way back in 2012, and I gotta tell ya, I haven’t missed him one bit. 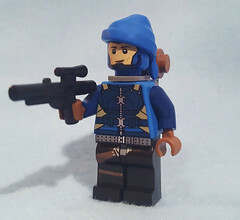 With all of the minifigs out there in the LEGO Star Wars universe currently in production that they could have put in, we end up with yet another SBD. Come on, LEGO, Clone Wars theme or not, you could have done better than this. Everybody sigh with me now: >sigh<. Clone Wars count: 2 for 2. No matter, tomorrow’s another day, and another chance for something great. We are now 4 for 4 for Clone Wars. Well, he COULD be a Stormtrooper. Hard to tell without a helmet since the torso and leg prints are pretty much the same but I’m not that lucky. So unless I get a Stormtrooper helmet in a future build to prove me wrong, I’m chalking him up as a Clone. You do get the new style Santa hat so it’s not all bad. And in an attempt to shake things up, instead of a blaster you get a mug. Enthusiasm Damp noodle diminishing. Disappointment rising. I’m not even going to bother hoping for anything else. At this point I should just try and guess what Clone-based build I’ll be subjected to tomorrow. Come back and find out with me won’t you? For no one should have to suffer through this alone. A weapons rack with, wait for it……. a Clone Trooper helmet. A mainstay of these advent calendars, they’ve always included a weapons rack so there’s nothing surprising there. They did mix things up a bit by including a Santa hat with the Clone Trooper yesterday and giving you his helmet today. ‘Cause otherwise, it would have been weird having a weapons rack with a Santa hat on it. For those of you keeping score like I have, that’s 5 for 5 with Clone Wars content. What do we have here now? Another Clone Wars model? Well that’s a surprise (I’ll leave it up to you if I’m being sarcastic or not). But you know what? 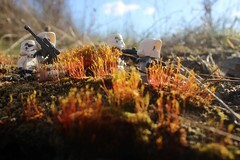 I could go the easy route and just complain endlessly about how today is yet another Clone Wars micro model but I won’t simply because it’s such a great model. It’s about on par with Day 1’s AAT. They kind of look alike too given the color scheme but since they are both Separatist Forces, it makes sense. The Vulture droid has a minimal number of elements (9 in all, not including the extra 1×1 dark blue plate) but uses it’s element budget effectively to capture the Vulture droid look and feel. With a little rearranging you can even simulate walking mode. 6 for 6. Will (Day) 7 finally be my lucky number? An E-web Heavy Repeating Blaster! So heavy that it takes a couple of Snowtroopers to carry it in and set it up before it can be used to fire on the Millennium Falcon in ESB. Kind of impractical if you ask me. The E-web uses the new style 1×1 round plate shooter but I guess the imperials were concerned about the weapon malfunctioning so much so that they’ve attached a small blaster on the top as a back up weapon. And that’s smart. It just makes sense to back up your main weapon by attaching a smaller, weaker weapon right on top of it. And it’s a good thing they did since it’s missing its power generator. Can you imagine, like, four snowtroopers hauling this thing around, setting up and realizing that the generator was missing? Snowtrooper Nick: Hey?! Where are Snowtrooper Dano and Snowtrooper Ken with that generator? Snowtrooper John: Screw this! I CALL THE MINI BLASTER! And yay, the Clone Wars Curse has been broken! Snowtrooper! Can’t have too many of these guys if you ask me, even if he is the older version. Yes, this is not the same one as the one you get from 75049 Snowspeeder or 75054 AT-AT sets. No fancy backpack or kama cloth. It could be that including the backpack and kama cloth would have put the set over budget in terms of element count, but still. There seems to be this trend now of having face prints on what used to be blank heads under the troopers’ helmets. The Snowtrooper is no exception as he comes complete with a toothy grin. I don’t mind the print so much but I really wish the Snowtrooper helmet was re-molded to take that into consideration, like lowering the eye holes to match up with the minifigs eyes. Or at the very least, have the print take the helmet into consideration. If you put the print facing forward like normal, and put the helmet on, the eyeholes hover over the forehead and you can see some edges of the forehead and eyebrows kind of peeking out. Or you could flip the head around so that just black shows through. I wish they had taken the Batman approach and give these guys an 80s headband so that just white shows through the eye holes without having to turn the head. Not a terrible entry by any means, but helmet issues aside, it certainly could have been better. Er, wait…. okay, so it may not be an OT build but this Jedi Starfighter is actually a pretty nice. Modeled after Anakin’s ship from the Clone Wars series, it is easily recognizable, sturdy, and swooshable. That Vulture Droid from Day 6 was pretty good too but if anything it was a bit delicate. This thing can swoosh for days without having to readjust/realign squat unlike the Vulture Droid. You and your spourse or your little ones can have epic space battles with Days 6 and 9. Current score: CW 7, OT 2. Time to rejoice for we get a micro TIE Fighter. Another excellent model at this scale. My only gripe would be that it would have been nice to get a few more 1×1 rounds to put on the top and the bottom to round off the ball cockpit a bit more. I suppose I could do that anyway with the ton of extra parts leftover from the previous days but still, despite that it’s a great model. Today may not have been Anakin like I was expecting. But I’m still anticipating a TIE Pilot for tomorrow’s build. I’m going to be thinking about this all day now. Why hello there, Mr. TIE Pilot. If you’ve kept up with this blog you should know how I feel about the current direction licensed minifigs are going with the trend of over-detailing. 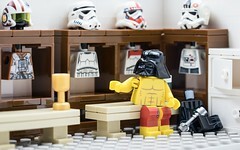 Batman’s torso from the Tumbler set, Han Solo’s face, and Luke’s face are all examples of this. But amongst all the overzealous attacks of the Sharpie upon minifig after minifig, there are a few that slip by inspection and make it out with minimal detailing, comparatively speaking, and the result is a minifig that strikes the perfect balance of detail while retaining some of the charm that is a LEGO minifig. Today’s TIE Pilot is one such figure. The only areas that seem too busy are the hoses coming out of the chest plate and perhaps the mouth grille. But the areas surrounding the hose and mouth grille are a little simpler in design making the minifigure overall easy on the eyes to look at. The way the figure is now, you can see the flesh peeking out from underneath from even just a side view since the back of the helmet is non-existent half way down the head. It’s jarring and completely breaks the monotony of the uniform and had the head been black the helmet wouldn’t look so ridiculous having half of it gone. The TIE Pilot looks great overall but man that flesh-colored head bugs me to no end. Viewing the minifigure from the front though, that’s the money shot, that’s the way to go. He gets a thumbs up from for this day. This landspeeder wins. And I’m going to go out on a limb here and say that even with 12 days left in the advent, the Luke’s Landspeeder is the best model in the entire set. The major color used in the model is tan, suggesting it is based off of either the original 7110 Landspeeder set or the 2012 New York Comic Con exclusive tin set since the later iterations have drastically changed it’s color pallet to be more accurate incorporating more sand red elements. Still, despite the innaccuracy to its on-screen counterpart, it is TOPS. I don’t think there is anything they could do to improve on the model aside from a color swap on a couple of elements and maybe perhaps a 1×2 trans-clear cheese for the windscreen. Love it to pieces! What the hell happened to his face? Those were pretty much the first words that came out of my mouth back when I first pulled him out of the Sandcrawler set and those were the same words I repeated as I took him out from behind door 13. He’s the same then as he is now and that is ugly. I mean seriously, what is LEGO trying to accomplish here with this face print? /shrug. Waddayagonnado? Anyways, he’s Luke, he skates on his landspeeder like a boss, he’s the same one you get the Sandcrawler and the Cantina sets so you can give this one to the kids and kiss it goodbye. A… moisture vaporator? Yeah, I’m pretty sure that’s what it’s supposed to be. I guess Luke’s special in that he gets another Tatooine artifact to keep him company. Not much to say about this simple build. It looks like a moisture vaporator. ‘Nuff said. A Snowspeeder! There’s a lot to like about this little guy. There’s a the general shape, the color schcme, the two laser cannons, the front and back canopy, the rear gunner’s tow cable weapon, the overly-efficient radiator grille, and the two exhaust ports or whatever those circular things are on the back. And it looks great if you look at it dead on from the back. But view it at any other angle, and you’re presented with an enigma of what can be done to improve the look. It’s like they got a lot of the details in but couldn’t figure out how to put it all together. I think another layer of angled plates to beef up the wings would done wonders. Maybe adding something like this ? I don’t know. Like I said, it’s an interesting enigma and I bet it could be improved upon. The LEGO Snowspeeder has a soft spot in my heart and my personal bias is totally coming into play here. If there was no bias I’d probably rip it to shreds. Final grade for today: A for effort, C+ for execution. Let’s call it a B and hope we get a Snowspeeder Pilot tomorrow. 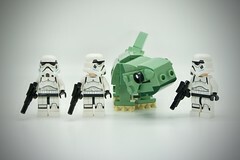 Or a brick built tauntaun. Or a Wampa. Or a probe droid. I could go on with what they could do with Hoth but I’ll stop here. Like this sweet Snowspeeder Pilot. Double sided head print has what I guess to be a scared expression on one side and a determined take-on-the-whole-Empire-himself look. The expressions get lost with all the detail going on around the face. The open mouth on the scared side is almost unnoticeable being so close to the clasp on the chin strap. I always find it funny when minifigures with double-printed heads have some part of the face show through under the hair or helmet when looked at from the back. The Snowspeeder Pilot is no exception as bottom part of the back of the helmet is scooped out high enough to expose the chin strap. I didn’t take a picture of this but you’ll have to take my word for it. With all the trouble they put in into putting details on the backs of the minifig torsos, you’d think this is one area they’d pay more attention to and realize that sometimes double-sided heads just don’t make any sense. There’s a ton of detail on the fig and the lines used to represent the folds and creases in the uniform are unnecessary. That was one step too far, the jumping the shark moment of the minifig, if you will. In contrast, his helmet is super plain. Not bad. Could have been better though. His head makes him unique to this set. So if you’re like me and like loading up on Snowspeeders, you can swap out minifigs to create your squadron. Fox hole! That’s probably the best way I can describe this. But it is seemingly above ground so that’s not really accurate. Weapons embankment? Gunner station? Yeah, that’s it. I’ll go with that one. I’ve been… kindly reminded that the 1×1 rounds that the blasters are shooting are snowballs. So be it. The Imperials may have an E-web heavy repeating cannon, but the Rebels have a pea shooter of their own in this gunner station. And much like the E-web, should the main battery fail, there’s a back-up mini blaster right at your feet. I imagine these things as squirt guns compared to the snowball launchers. I suppose someone had to man yesterday’s Gunner Station and this here be that man, General Carlist Rieekan of Hoth fame. He’s exactly the same as the one you get in the current old Snowspeeder set (75014) so if you’ve already got that set or were planning on getting it, you’re doubling up on a named character. I was never a fan of the use of this particular head for Rieekan simply because he seems too angry compared to the on-screen counterpart. If Rieekan didn’t have a look of concern on his face while trying to safely evacuate a Rebel base, he was smiling as he bid farewell to Han. An alternate expression on the other side of the head to compensate would have been welcome. A big ol’ MEH for today. Not exactly thrilling, accurate, or really all that desirable to be honest. I can probably count on one finger how many LEGO Star Wars minifigure wishlists this guy cracked the top 10 on. Or top 20 for that matter. Let’s hope tomorrow’s build returns us to the awesomeness. I think it’s some type of speeder. The two prongs in the back make me think it’s related to the ROTJ speederbike. The front half looks all wrong, and I say it’s the front half due to the way the emergency short blaster pistol is oriented. Of course, it could be a rear defense weapon. It’s extra difficult to tell which way it’s supposed to be driven since there aren’t any handlebars. You could say that the engines, if compared to the landspeeder, should always be in the back thus, it resembles the speederbike more and more but then it’s not a speederbike because speederbikes don’t have engines protruding from the sides. So then if it’s some other type of speeder, then what’s with the short blaster pistol? Is it really a rear defense weapon? It’s a bit odd to add that kind of detail when there are no forward-facing weapons. Is this like… an Episode VII speeder that’s evolved from the ROTJ speeder given the events of Endor? I don’t know… I kind of get a strange hybrid Count Dooku Solar Sailor / Mon Calamari Cruiser feel from it for absolutely no reason whatsoever. I don’t know. Your guess is as good as mine I suppose. It’s probably from some Clone Wars episode. Then you got the satchel in the front which is odd place to put your storage, assuming that’s the front and not the back. If it was the back it would totally make sense putting that there. It’s got a gift inside the satchel to give it that holiday feel. And in case you’re wondering, I did NOT spend a lot of time thinking about this. Candy! Imperial Shuttle? or Imperial Landing Craft? 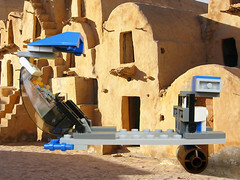 I’m leaning towards the Imperial Landing Craft simply because of the wide body but not many people may even know what one is, or even know that LEGO even made a set of it back in the day. Hard to believe that thing is almost eight years old. Anyways, no matter which vehicle you associate this micro model with, you just can’t lose. The airplane tail fin and flag elements recreate that iconic look of the shuttle/craft so well that you would think they were made specifically for this purpose. And the back has a trans-blue grille tile to simulate the engines. It’s a nice little build and thankfully easy to recognize compared to yesterday’s doohickey. Aaaaaand we’re back to Clone Wars. Which, at this point, isn’t really all that disappointing. We’ve had a good long run of OT stuff and some pretty sweet builds along the way, so having Anakin’s Y-wing Starfighter for today’s advent doesn’t bother me as much as you would think. It’s actually not a bad build but could have been made better. The designer could have built it with more yellow and white and less gray and dark gray. You could argue it’s an OT Y-wing, but there’s too much yellow in it to convince me of that. So now we’ve had two builds that could have used Anakin to go with them but he ain’t around. I guess they’ll always have each other. Oh, Fireplace, Fireplace. How much do I hate thee? Let me count the ways. I hate thee in exactly three ways. The first way is the holocron cube. Way to bring us back to Clone Wars. The last two ways are on each side of the fireplace. I hate thee because the designer has no concept of how lightsabers actually work. How in Yoda’s name are those clips not melting? Adding another brick or a couple of plates even to raise the 1×1 clip plate to attach at the hilt instead of the blade seems like a no-brainer and should have been done! I really doubt an extra piece or two would have had a detrimental effect on the overall cost of the advent calendar. Look. 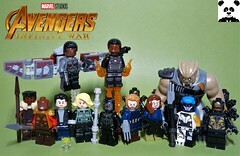 I can forgive the designer(s) not being familiar with the source material due to not being divulged plot points, or even a rough cut of a movie to base their designs off of, like set 76008 Iron Man vs. The Mandarin: Ultimate Showdown or the entire Cars 2 line. Because I find it hard to believe that the set was made purposefully bad and unfaithful to the original. That’s fine, and we’ll always give LEGO a hard time about this but with an understanding that the situation under which the set was designed was most likely not ideal and beyond the designers’ control. But this fireplace. There is no excuse for this. 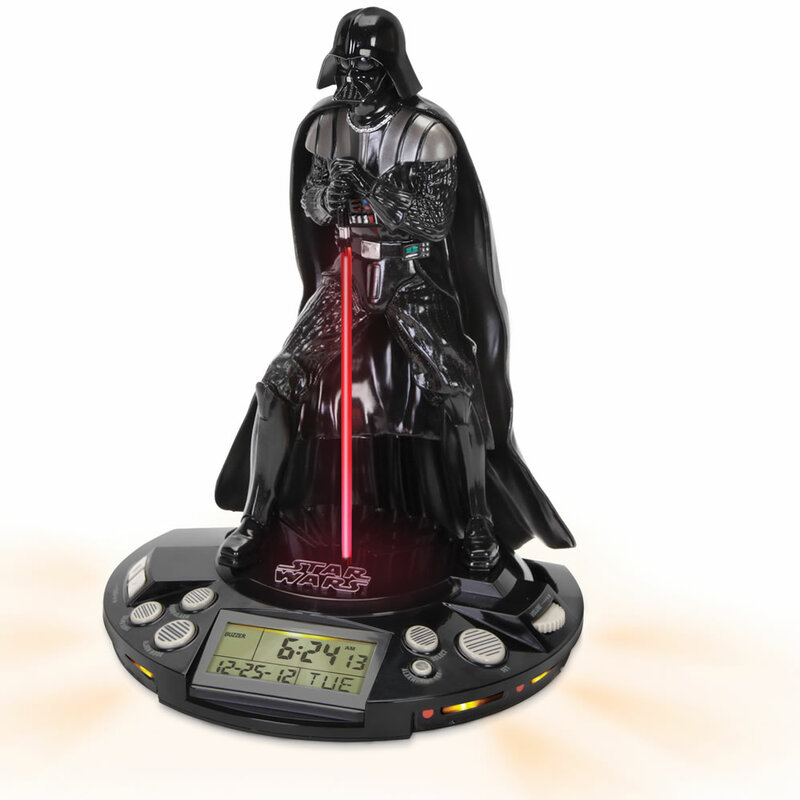 It’s about as dumb as that Darth Vader Coin Bank. I mean, how long have we been following the license? 16 years now? And we’re still subjected bad designs that go against the fundamental laws of lightsaber physics? Come on. The ONLY explanation that I can think of that would allow those clips to not melt under the heat/energy of the lightsaber blade is that they are made from the exact same material as the handrails used in the core of Bespin. You know that scene, that scene where Luke and Vader and duking it out right before Luke’s hand gets lopped off. ‘Cause, man, those lightsaber blades be bouncing off those rails as if they were made of rubber or something. Maybe, just maybe, that same mysterious lightsaber-resistant alloy was used to specifically make lightsaber display clips so that proud Jedi could to display their signature weapons next to their fireplace. This month is chock full of minifigs and fantastic little builds. There’s a heavy Clone Wars emphasis but even with that, the builds have been mostly enjoyable. The holiday-themed minifigs are nice but if I had to pick between the two, I’d go for the droid simply for the versatility of the tree cone element and the dark green torso and legs of the astromech. As for a final score, I’d give it a solid 4. It’s nice that LEGO can do an Advent Calendar that’s not City or Castle. Though I do wish they would expand licensed calendars and make a Super Heroes-themed calendar. They would just be printing money at that point.